Our focus is on companionship, care and assistance around the home. Thank you in advance, I’m not sure if you realise how much both Mick and I appreciate your help with mum. Thank you for the work you and your team do. It’s a huge relief to know that someone is keeping an eye on dad for us. Little and often is perfect. I have always been a very active person until recently; arthritis changed my life completely making me lose my confidence in doing the things I took for granted, walking, shopping and housework. Nannies 4 Grannies are helping me see light at the end of the tunnel by assisting me with these everyday chores and spending time with me at home. 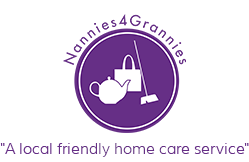 I like the fact Nannies 4 Grannies are local and have no hesitation in recommending them.